One bowl brownie recipe; This brownie recipe from scratch requires just one bowl. No need for a box mix, make this one bowl brownie recipe from scratch in just a few minutes. Chop chocolate, and place chocolate and butter in a microwave safe bowl. Microwave in 30-second intervals, stirring between each, until mixture is mostly smooth and melted. Add vanilla and sugar, and mix well. Add flour and oil, and stir until combined. Pour mixture into a foil-lined 8×8 pan. Optional: Melt Nutella for 10-30 seconds in the microwave, and drizzle over batter. Use a spoon or knife to swirl into batter. 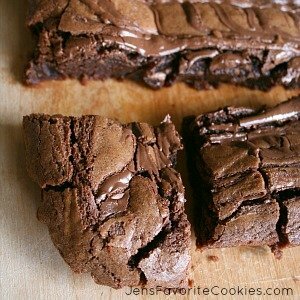 Bake brownies at 350 degrees for 30-35 minutes. until edges are dry and pull away from the pan slightly.